1. Prices now start at $399 (US) for the Junior edition. Significant Discounts are available if more than one license is purchased at the same time. 2. You can try the complete program free of charge before deciding whether to purchase. The only restrictions are the number of entries you can input and you are limited to 14 days usage. 3. 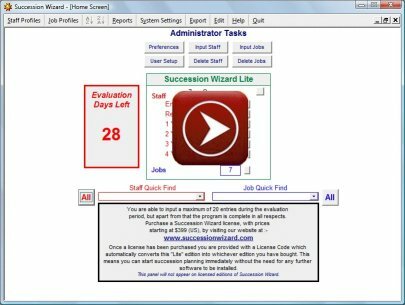 Succession Wizard is genuinely "off-the-shelf" software which means you can start using it TODAY. There is no need to delay implementation (as is usually the case with most HR software). Simply download the program; if, after evaluation, you then wish to buy you can purchase online and a license code is emailed to you. 4. Workforce management helps to match suitable people to specific jobs. Also find roles which fit the competencies of an individual. 5. There are a number of ways in which Succession Wizard can be implemented. The program can be run over a network with information shared amongst a number of users; or alternatively on a single PC or laptop by an administrator looking after a number of business units. 6. Reports displaying management planning information can be configured to match user criteria. The content can be filtered to ensure only required information is shown. 7. Information can be imported from (and exported to) other systems allowing existing information to be quickly incorporated. 8. Annual software support available including all upgrades during the support period. Click for short animation of key features. A key benefit of using Successor Wizard over competitor products is that you can expect to be fully operational and producing effective succession plans within hours of implementing the solution. There is no need for expensive consultants to configure the software, or to purchase additional hardware, as the application is designed for standard Windows desktop PC's and can be setup within minutes of downloading. Succession planning, along with workforce management in general, is increasingly regarded as a growing influence in determining the success of an enterprise. If it is undertaken effectively then it can ensure that your organization has capable and trained managers to guide its growth. With the move to flatter management structures, succession planning is insurance for when key people leave an organization. With fewer layers of middle management available to fill these key roles it is important that potential successors are identified early and given appropriate training so that when the time comes for their move to more senior roles disruption is minimized. allowing you to focus on areas of concern. all information with just a couple of clicks.